I lost count of the number of concerts I have attended since the 1980’s but the number is much higher than my feeble intelligence quotient (“IQ”). Even with my troglodytic disposition I can spot a polished professional band before the first verse of the set opener. 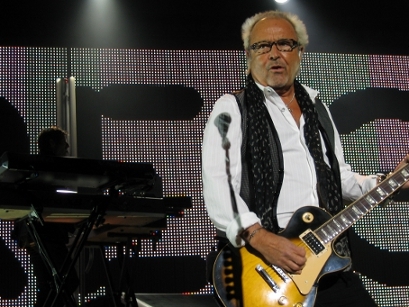 Foreigner is undeniably such a band. Foreigner is more like champagne than malt liquor, more like the opera than open mike night at a dive bar, more like steak than Spam, more like … well you get the point. 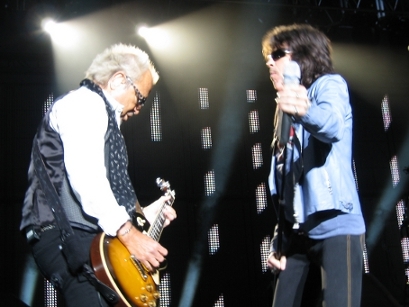 On May 25, 2010 Foreigner played the Concord Pavilion. 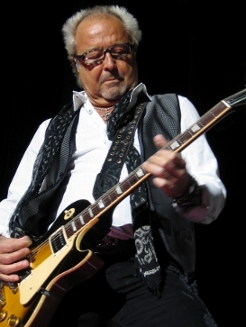 Foreigner played a 12 song, 80 minute set from 9:37 to 10:57. 1. Double Vision (Double Vision record, 1978) is a mid tempo song that began with Mick Jones’s (“MJ’s,” lead guitarist) catchy guitar chord progression and run. MJ wore black Converse sneakers, black jean pants, long sleeve white cotton shirt with vertical satin stripes, black scarf with an intermittent white pattern, and black vest with very fine white polka dots minimally spaced from one another that gave the vest a grey appearance from afar. [As I stood in the photo pit three feet from MJ I was impressed by his dapper state. MJ had a golden tan George Hamilton (American film and television actor) would envy. MJ’s fingernails were finely manicured as if he was about to attend a knighting ceremony by Queen Elizabeth II, and his moustache and goatee were so neatly trimmed his stylist must have used a diamond measuring magnifier.] 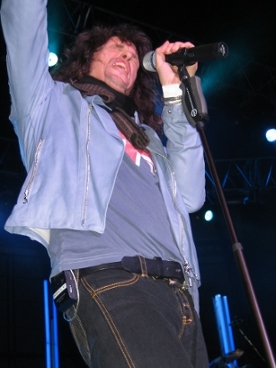 Immediately before Kelly Hansen (“KH,” lead vocalist) sang the first verse, at approximately the 0:15 mark (approximations presumed throughout), Brian Sutter (“BS,” drummer) played a series of drum fills. 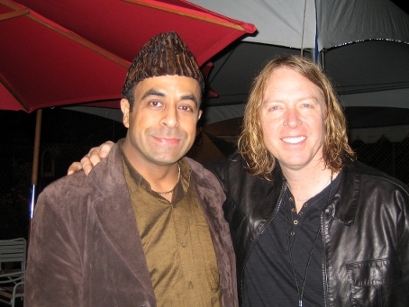 The first and second verses featured MJ and Thom Gimbel’s (“TG’s,” rhythm guitarist, saxophonist) chugging guitar chord progressions and Jeff Pilson’s (“JP’s,” bassist) trudging bass lines. During the first and second choruses the tempo slightly slowed down and prominently featured Michael Bluestein’s (“MB’s,” keyboardist) keyboard notes. The tempo escalated and resumed a mid tempo pace when KH sang the last line of the choruses, “My double vision gets the best of me.” During the last 60 seconds of the song the band sang the third chorus. 2. Head Games (Head Games, 1979) is a mid tempo ballad that began with MJ’s guitar chord progression augmented by JP’s solid bass lines and MB’s high keyboard notes. In addition to KH’s powerful voice the first and second verses prominently displayed MB’s keyboard chord progression and JP’s punchy bass lines. JP wore grey sneakers with hot pink trim, black jean pants, and long sleeve black cotton shirt. 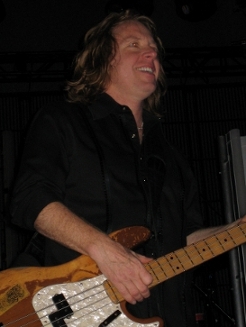 JP mainly played a natural wood Fender Precision bass with a pearl colored pick guard. [JP is the rocker in the band. JP did not look much different than the first time I saw him perform as Dokken’s bass player opening the show for the mighty Judas Priest in Oakland, California on May 15, 1986, just less hairspray and makeup, somewhat like a girl who goes from being on a first date to becoming a housewife. JP headbanged through most of the set, even during power ballads. Foreigner could have performed the nursery rhyme Mary Had A Little Lamb and JP would still have headbanged as if his head contains a metronome compelling him to do so.] During the first chorus the tempo slightly escalated for 15 seconds, and MJ’s guitar chord progression came to the forefront as KH sang, “Head games … it’s you and me baby. Head games … and I can’t take it anymore. Head games … I don’t wanna play … the head games.” KH then sang the second chorus after which the band engaged in a 30 second jam during which MJ played a memorable guitar solo and KH a tambourine center stage atop the metal ramp next to MB. KH then sang the third verse and chorus. 4. 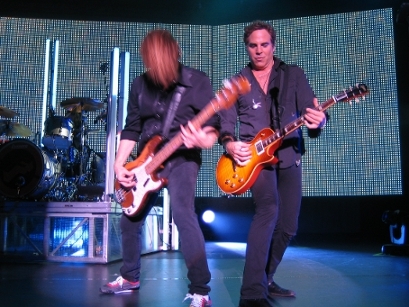 Can’t Slow Down (Can’t Slow Down, 2009) is the up tempo first single from the band’s most recent record that featured MJ’s groovy guitar chord progression during the first verse. MJ’s catchy guitar riff introduced the first chorus that featured a memorable melody augmented by MB’s keyboard notes and back up vocals. 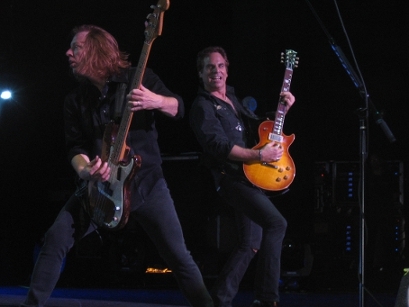 KH then sang the second chorus after which the tempo slightly slowed down, and JP provided a solid foundation for MJ to play a guitar solo on his black Gibson Les Paul. 5. Dirty White Boy (Head Games, 1979). Before Dirty White Boy KH said, “How many naughty girls do we have out there? 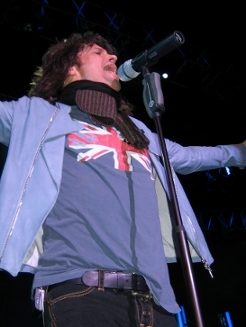 (screams from female audience members) That’s perfect because I am a Dirty White Boy.” KH wore white sneakers, tight navy blue jean pants, navy blue t shirt with Union Jack logo, black scarf with brown and black vertical stripes on its ends, and powder blue leather jacket. [KH comes from the Mick Jagger school of rock, not only in terms of some stage moves, but also his lanky frame and prominent mouth.] 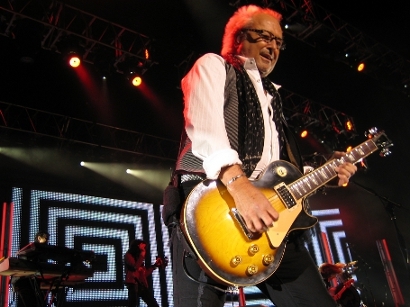 Dirty White Boy is an up tempo song that began with a catchy, bluesy MJ guitar riff reminiscent of B.B. King (black American blues guitarist, singer) that he continued to play into the first verse. When KH transitioned from the first verse to the first chorus the tempo slightly escalated. The first chorus began and ended with BS’s rapid drum fills and also featured JP’s punchy bass lines as KH sang, “’Cause I’m a dirty white boy. Yeah a dirty white boy. A dirty white boy.” The phrase “Dirty White Boy” repeatedly flashed in white letters against a black background on the video screen that stretched to the ends of the large stage. The video screen was comprised of 44 rectangular shaped panels mounted in two rows, each containing 22 panels. During the second verse the tempo slightly slowed down and prominently featured MB’s keyboard chords. MJ then played a fiery, fluid 20 second guitar solo on his black Gibson Les Paul that concluded with harmonic notes. The band then sang the third chorus followed by the third verse that featured two memorable MJ guitar runs. During the last 60 seconds of the song the band thrice repeated the chorus. Dirty White Boy and another song to be performed received the strongest audience reaction. 6. In Pieces (Can’t Slow Down, 2009). Before In Pieces KH said, “Thank you. I don’t know about you, but I’m having a good time. We would like to do our current [second] single off our new CD, In Pieces.” In Pieces is a slow tempo ballad. BS’s solid mid tempo drumming and MB’s keyboard melodies were the focal points of the first and second verses during which the melodic guitar notes MJ played on his white Gibson Les Paul were barely audible. [MJ’s Les Paul is beautiful. I was mesmerized by its virgin beauty augmented by bright gold hardware. MJ’s guitar looked as if it had been meticulously buffed by a master craftsman going so far as to use Q tips for the saddle bridge. MJ’s guitar shined in the spotlight like a forbidden jewel, leaving my mouth slightly ajar and salivating. I felt like Indiana Jones when he stood before the golden fertility idol statute based on the Aztec goddess Tlazolteotl inside the ancient Mesoamerican cave in the opening scene of Steven Spielberg’s action adventure film, “Raiders of the Lost Ark” (1981).] Positioned adjacent to the interior portion of BS and MB’s risers were two metal ramps sloped upward at 30 degee angles and slightly angling away from one another. [MJ rarely walked on the ramps, negating the need for them to feature a moving walkway like those found in airports to prevent the onset of fatigue. (Just kidding Mr. Jones with a little age based humor with no offense intended.)] The outer edge of each ramp was bracketed with a fluorescent light positioned directly in front of a pair of 15 feet high fluorescent lights vertically positioned behind the interior portion of MJ and BS’s risers. 7. Starrider (Foreigner, 1977). Before Starrider KH said, “Thank you Concord for letting us play some new stuff. I am going to turn it over to Mr. Mick Jones.” The spotlight shifted to MJ as he said, “Northern California feels like home. We play here often back to the days of Day on the Green [name of a concert series presented by Bill Graham and held at the Oakland Coliseum Stadium in Oakland, California from 1973 to 1991] and Bill Graham [rock concert promoter from the 1960’s until his death on October 25, 1991], may he never be forgotten. Now let’s go back to the first album. I have to try and remember the words (laughter). It’s a favorite of a lot of our fans. Starrider.” Starrider is a slow tempo ballad that began with TG’s atmospheric flute playing, BS’s subtle cascading cymbal crashes, and MJ’s acoustic guitar chords on his black Gibson Les Paul. MJ sang the first verse with emotion supported by JP’s prominent bass lines, TG’s flute notes, and KH’s tambourine beats. 8. Feels Like the First Time (Foreigner, 1977). Before Feels Like the First Time MJ said, “We are going to go back to the beginning.” Feels Like the First Time began with MJ’s loose guitar chord progression that was soon accompanied by JP’s bass lines and BS’s cow bell. During the next 20 seconds MJ played a recurring high guitar note while the audience clapped along. The first half of the first verse featured a fairly slow tempo while the second half, introduced by MJ’s solid guitar chord progression, featured a mid tempo pace. The band then sang a 20 second catchy chorus during which the fluorescent lights vertically positioned behind BS and MB’s risers and bracketed on the ramps turned various colors (e.g., red, blue, pink, violet). [For those that had popped acid the lighting spectacle must have made the show akin to Disneyland’s Alice in Wonderland ride.] KH then sang the second verse halfway through which the tempo increased from slow to mid tempo. The band then sang the second chorus during which the tempo momentarily slowed down but escalated back to a mid tempo pace as KH sang the last line, “Like it never will again, never again.” The mid tempo pace continued through the third chorus after which MJ played a guitar solo on his tobacco sunburst Gibson Les Paul while KH sang the pre chorus, “Open up the door, won’t you. Open up the door … yeah.” The audience clapped along to JP and BS’s solid bass lines and drum beats. The band twice repeated the chorus. 10. Juke Box Hero (4, 1981). Before Juke Box Hero the stage was immersed in darkness except for a few dark green stage lights that served as the cue for MB to play a series of keyboard notes. MB wore black sneakers, black jean pants, and a black T-shirt. 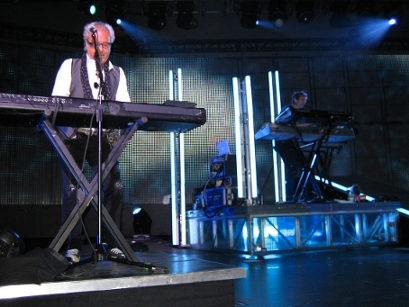 MB played three keyboards, two Roland and one Korg. MB and BS jammed for 30 seconds. 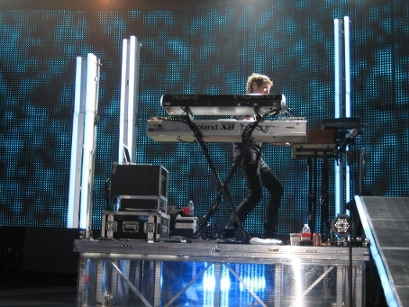 MB’s keyboards and BS’s drum set were each positioned atop two feet high metal grill risers. Two pairs of eight foot high fluorescent lights were mounted on the outer part of each riser, and a third pair 15 feet in height was positioned on the interior rear portion of each riser. The lights turned various colors during the show. Juke Box Hero began with JP’s trademark trudging bass lines. KH appeared at the rear of the stage on the ramps that had been coupled together. Within 10 seconds KH sang the first verse while atop the ramps, “Standing in the rain … with his head hung low. Couldn’t get a ticket … it was a sold out show. Heard the roar of the crowd … he could picture the scene. Put his ear to the wall … then like a distant scream. He heard one guitar … just blew him away.” The first verse featured a fairly slow tempo until the final line when, with the introduction of MJ’s power chords and KH’s dash down the ramps, the tempo escalated to an up tempo pace that continued halfway through the second verse. When KH sang the final line of the second verse MJ abruptly stopped playing power chords and the tempo slowed down. The third verse featured a fairly slow tempo until KH sang the phrase, “that one guitar” when, with the return of MJ’s power chords, the tempo escalated to an up tempo pace that continued through the fourth verse, pre chorus, and first chorus. After KH sang the final line of the first chorus the tempo momentarily slowed down only to resume an up-tempo pace during the fourth verse that continued through the fifth verse and second chorus. Shortly before his guitar solo MJ played a chugging guitar riff that marked the start of a loose jam. MJ then played a 25 second guitar solo. MJ demonstrated his dexterity by beginning his solo with left hand vibrato and finger tapping on the fretboard of his tobacco sunburst Gibson Les Paul. The band then jammed center stage during which KH played a tambourine. Juke Box Hero was performed as an entertaining 9 minute song and, along with Dirty White Boy, received the strongest audience reaction. When Juke Box Hero concluded KH said, “Thank you Concord! Thank you so much!” The band left the stage at 10:43 and returned in less than one minute to play two additional songs. 11. I Want to Know What Love Is (Agent Provocateur, 1984). Before I Want to Know What Love Is KH said, “You want to hear more music? Then I want you to make some noise. I need your help. Put your arm around the person next to you.” [This was not a problem for me because my 78 year old mother was my date for the show.] I Want to Know What Love Is was the second song that featured MJ on keyboards and began with MJ and MB’s atmospheric balladesque keyboards and BS’s gentle drum beats. Within 20 seconds KH sang the first verse, “Gotta take a little time. A little time to think things over. I better read between the lines. In case I need it when I’m older.” A 15 second interlude that prominently featured MJ and MB’s keyboards separated the first and second verse. KH then sang the third verse and first chorus. During the first chorus the tempo slightly escalated as KH sang accompanied by plenty of audience participation, “I want to know what love is. I want you to show me. I want to feel what love is. I know you can show me.” While KH sang the fourth and fifth verses the tempo slowed down to its initial pace. 12. Hot Blooded (Double Vision, 1978). Before Hot Blooded KH said, “Thank you for letting us in your home. We are jazzed to entertain you. We had a great time.” Hot Blooded began with MJ’s chugging mid tempo guitar chord progression on his tobacco sunburst Gibson Les Paul. Interestingly, the song began with a catchy chorus as KH sang, “Well, I’m hot blooded, check it and see. I got a fever of a hundred and three. Come on baby; do you do more than dance? I’m hot blooded, I’m hot blooded.” KH then sang the first verse augmented by MJ’s solid mid tempo guitar chord progression. The tempo slightly slowed down while KH sang the first pre chorus augmented by MB’s keyboards, “Now it’s up to you, we can make a secret rendezvous. Just me and you, I’ll show you lovin’ like you never knew.” The tempo slightly escalated while KH sang the second chorus and verse with the latter featuring a series of searing MJ guitar runs. KH then sang the second pre chorus and third chorus followed by MJ’s guitar solo. The song ended with the fourth chorus. The band took a bow and left the stage. Two flashback memories are worth mentioning. First, I recall sneaking into my sister’s bedroom in 1977 while she, who I will call She-Fro, stood 15 feet away in her bathroom combing her afro using a brush the size of a waffle iron. I wanted to shut off her stereo because I was too young to appreciate Feels Like the First Time blasting on her stereo and her off key humming of the melody. Steadfastly clutching my Darth Vader Star Wars action figure in one hand I used the other to hit the stereo tuners “Off” button, and then I bolted. Having witnessed this covert act on prior occasions, She-Fro was on guard even though she had a look of intensity in her eyes as she stroked her Afro as if meticulously adjusting the thick frosting on a wedding cake for the British royal family. She-Fro chased me brandishing the waffle iron as a weapon and struck my thigh, eventually creating a bruise. Using crude forensics I meticulously rummaged through my multi colored marker collection and found a taupe colored marker that replicated the bruise’s hue. A week or so after the bruise subsided I used the marker to create a fake bruise mark on my thigh. I sheepishly showed the bruise to my mom when she got home. With an angry tone my mom asked how I acquired the bruise. When I apprised my mom of the assailant she stormed into She-Fro’s room and slammed the door shut as if closing the lid on the soon to be reprimanded She Fro’s coffin. I got the last laugh. Second, as I previously mentioned I took my mom, who I will call Mama Kin, to the concert. 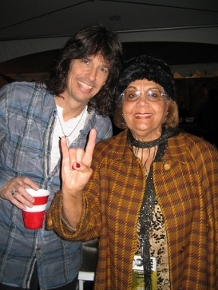 Mama Kin had a wonderful time throwing the devil horns backstage with the band and enjoying the show. During the set I sneaked a look at Mama Kin and observed her gently bobbing her head and intently watching the raucous blistering show. I now realize the origin of the metal torch I valiantly carry close to my heart. Mama Kin bore the same look of intensity I possessed when I attended my first concert more than 25 years ago. Rock on mom, rock on! Venue: Concord Pavilion (“CP”) is an outdoor ampitheater built in 1975 and designed by Pritzker Prize-winning architect Frank Gehry and landscape architect Peter Walker. Gehry also designed the Guggenheim Museum in Bilbao, Spain and the Walt Disney Concert Hall in Los Angeles, California. CP was built in response to the East Bay community’s desire to have a venue for the annual Concord Summer Festival. CP is set in a natural bowl below Mt. Diablo. CP was remodeled in 1996 to increase seating and make additional improvements. CP has a 12,500 seat capacity comprised of (1) three tiered seated sections and (2) perimeter lawn section. For a period of time Concord Pavilion was called the Chronicle Pavilion, and it is currently called the Sleep Train Pavilion, both corporate entities that purchased naming rights. 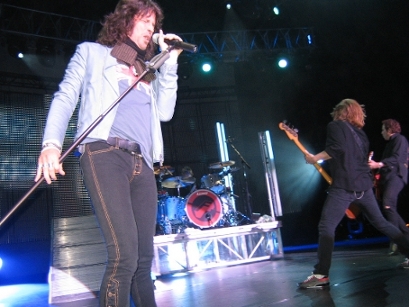 This entry was posted in Concert Reviews and tagged Foreigner. Bookmark the permalink.